Calling all Pescetarians! 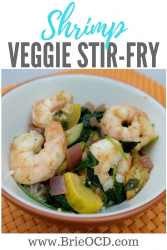 This Shrimp & Veggie Stir-fry is so easy to make! It only takes a little over 20 minutes from start to finish so it’s the perfect dinner when you are short on time. It is low calorie, low fat and high in protein. It can easily be made gluten-free by using gluten-free hoisin sauce. 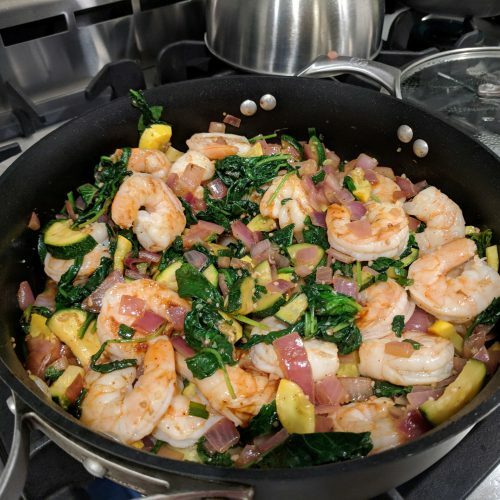 This recipe is packed with nutrient rich shrimp. Shrimp is low calorie, high in protein and has been known to help reduce inflammation. 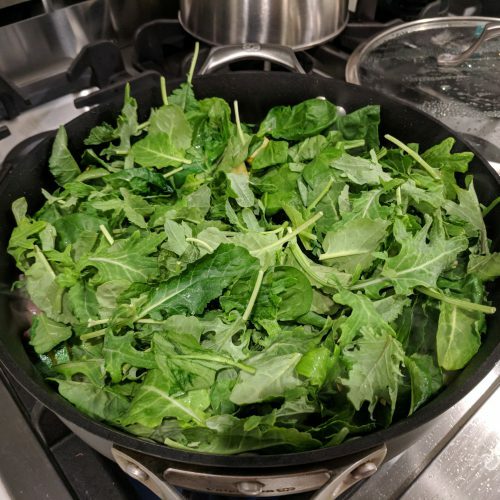 Pair that with kale and spinach and you have a recipe that is bursting with protein, vitamins, antioxidants and minerals. 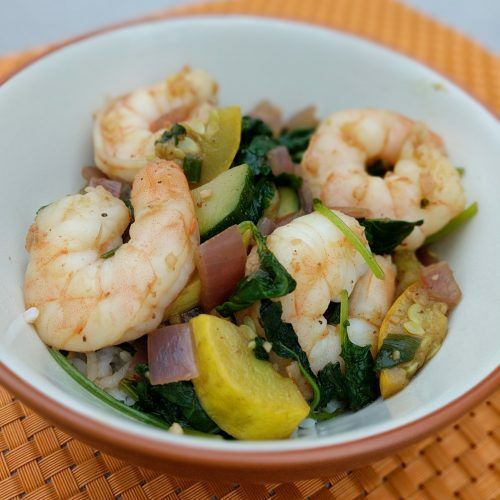 This shrimp & veggie stir-fry has only 229 calories, 7g of carbs, 6g of fat and wait for it……. 82g of protein. DAAAAMMMNN GINA!!! I serve this with regular ol minute white rice, however you can serve it over white or brown rice. If you are looking for a lower carb option, serve over Cauliflower Rice (click here for that recipe). Please note, the stats above do NOT include the rice. 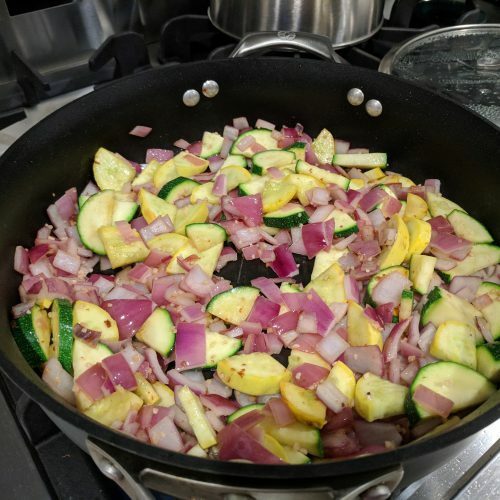 I added zucchini and squash to my stir-fry but you can go crazy! Add whatever veggies tickle your fancy. Just make sure to adjust the other ratio’s accordingly. The word stir-fry just sounds unhealthy doesn’t it? Well it isn’t if you make it yourself and stick to lean proteins, veggies and a small portion of complex carbs. 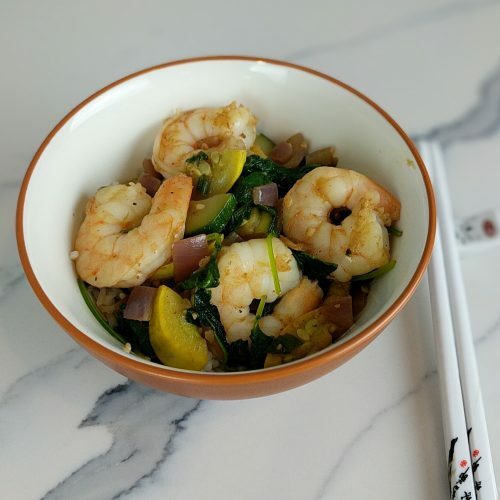 I have been loving stir-fry because they are super easy and quick to make. Anything that I don’t have to slave over for hours is A-OK in my book! 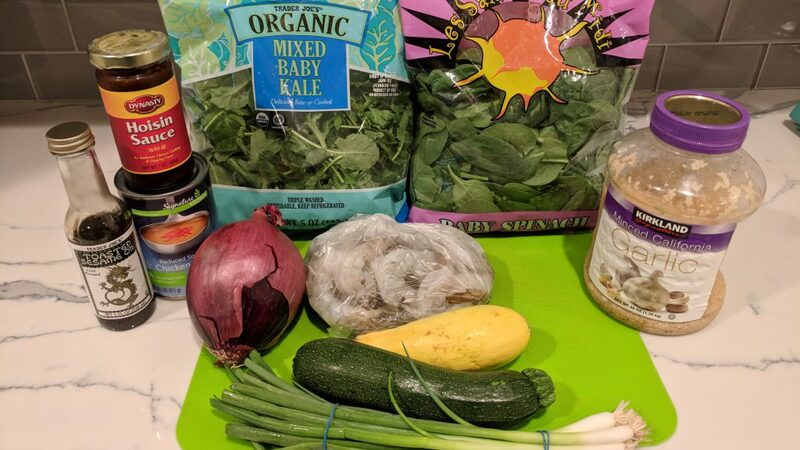 Hope you enjoy this simple, healthy recipe as much as I do! heat 1 tsp toasted sesame oil over medium high heat in a skillet. add the shrimp and cook for about 3 minutes flipping halfway through. 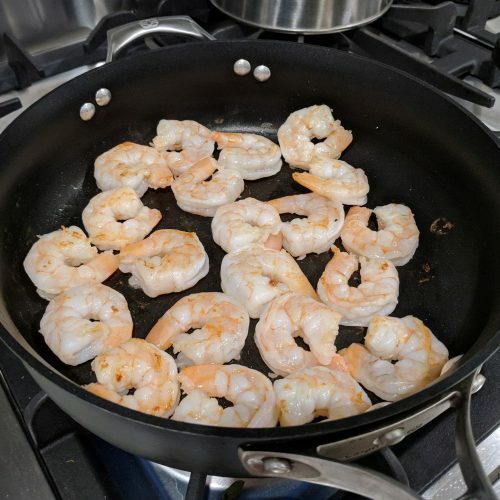 put shrimp aside in a small mixing bowl/plate. heat 2 tsp of toasted sesame oil in skillet over medium heat. Add the garlic, onion, zucchini, squash and scallions. Cover and cook for about 3 minutes, stirring occasionally. add the broth and cook for another 3 minutes or until the broth is almost 3/4 absorbed. stir in the shrimp and the hoisin sauce and cook for another 1-2 minutes, stirring occasionally. serve over white rice, brown rice or cauliflower rice and enjoy!